Since I made a whole turkey this year for Thanksgiving, I inherited all the giblets that came with it. I used the neck and gizzard to make a delicious and nutritious gravy. Therefore, I was left with the liver and heart from my petite local, pasture-raised bird. The experience of cooking organ meats is completely new and foreign to me, and honestly, something I never in my wildest dreams thought I’d be doing. At every holiday meal growing up, I turned up my nose when my dad would eat the giblets (my mom always cooked them for him & she would’ve never heard the end of it if she didn’t), and seeing my grandma eat liver n’ onions in a restaurant was enough to make me get sick to my stomach. Well, after a lot of research, reading and exposure to the traditional foods and paleo world, I’ve come around and am now open to the idea of organ meats. Granted, I cannot eat them on their own, but rather, they need to be disguised. If it’s distinguishable, it won’t work for me. That’s why I figured a meatloaf would be the perfect way to go. The worst part was cutting up the heart and liver. The liver cut easily and almost melted in my hands, but the heart was tough and fibrous in spots. I say this was the worst part because I felt nauseous while doing it, and didn’t even know if I’d be able to eat the meatloaf. Thankfully, the nausea wave and lump in the back of my throat passed. If you have a hard time chopping things fine, feel free to do so in the food processor. I ended up using mine because I had too big of pieces and really wanted the organs to be ground up well. Feel free to do this after sautéing everything or before — either will work. If you’re wondering, I did it after. This meatloaf turned out wonderfully and the organ meats are not recognizable or distinguishable at all! 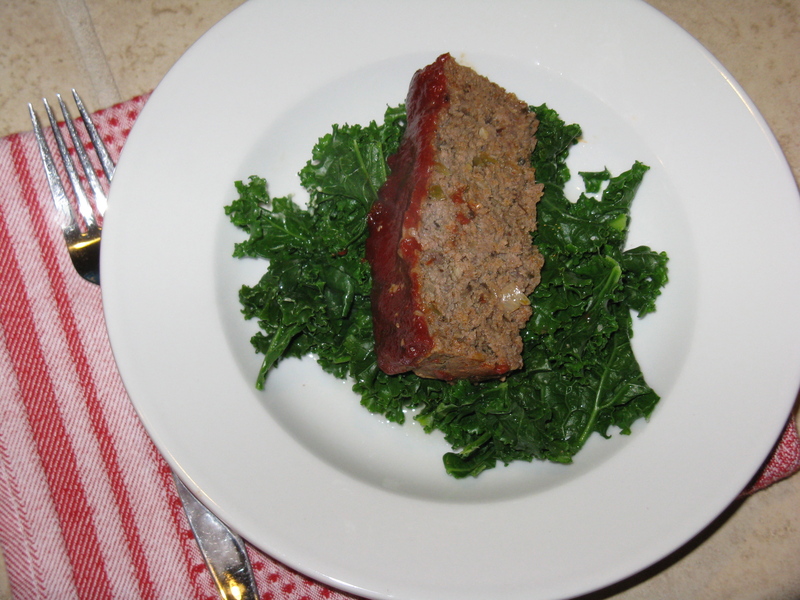 Also, this meatloaf recipe was inspired and adapted from here. Oh, and plus refers to the addition of heart and liver. 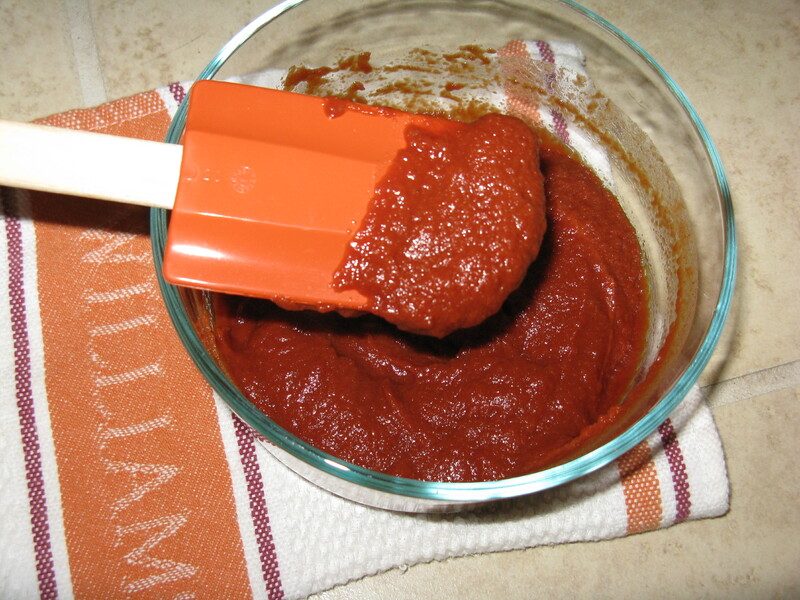 For the ketchup, mix all the ingredients together in a bowl and whisk well to combine. Store in the refrigerator. In a medium-sized skillet over medium heat, melt the ghee. Next, add the mushrooms, onion, celery, heart and liver. Sauté for a few minutes. In a large bowl, combine the beef, salt, pepper, egg, heart/liver/veggie mixture, chili flakes, thyme, oregano and garlic. Mix well, makng sure to break up the meat. Lightly grease a large loaf pan and fill it with the meatloaf mixture. Place in the oven and bake for 15 minutes. Meanwhile, in a small bowl, make the ketchup for the top of the meatloaf. After baking for 15 minutes, gently spread the ketchup on top of the loaf. Continue to bake for another 40-45 minutes. I don’t think I could work with the organs but go you for doing it : ) I do need to get around to making my own ketchup! Your blog always makes me feel like a fake cook because everything you make is so unique and looks so good!!! You might surprise yourself someday 😉 Seriously, I never EVER thought I’d be eating and cooking them either, but when faced with the decision to compost or eat them, I went for it. Plus, I knew they were high quality since they came from a local, pasture-raised turkey. Don’t be hard on yourself … you are not a fake cook! Things take time and I get lots of inspiration from others. I have noticed my creativity increase in the kitchen and yours will too as you keep cooking — I promise. I will, its been on the to-do list! Thanks for the words of wissssdom! This doesn’t make me feel gross at all… I grew up with my mum making us liver all the time, and she wouldn’t hide it in anything she would just stand at the stove cook up a whole bunch with just some salt added and say come eat it. I used to hate it but then I grew to really like it and sometimes my dad would mix it into the kebabs he made. I haven’t made it myself in a very long time but planning on making some chicken liver pate soon. I’m glad to hear that 😉 I never grew up eating this stuff because my mom didn’t care for it. She grew up being forced to eat liver and whatnot, so it never fared well with her, understandably. I probably wouldn’t have touched it as a kid anyway because I was so, so picky. I have tried the liver pate from Practical Paleo before (didn’t make it myself — was at a Practical Paleo workshop), but didn’t care for the texture or flavor much. I’m guessing it grows on you? Funny/interesting story about that. Some years after my dad had left that job we went to a Michael Jackson concert, this was in 1996 and like a bunch of crazy fans we went to his hotel the next day. Anyway turns out one of the security guards worked with my dad back in the pate company and he recognised my dad straight away! So they got to chatting and before we knew it he was letting us go in to see Michael! Ended up getting some photos with him and his signature on a piece of paper! But can you believe I have no idea where those pictures or autograph are now… oops! Hahaha I know I’ll have to look for them when we go back for a trip home!